The 21st century curriculum for public servants. I’ve been interested in how governments and public servants should learn for many years. This short blog shares some lessons about learning, and why I think many courses and events are much less impactful than they could be. The prompt is that Nesta recently launched States of Change with partners across several continents to provide a new way to re-energise public purpose: helping governments address solving complex problems; countering the tendency of bureaucracy to crush creativity and promote cynicism; and leaving behind public agencies that are high energy and restless in finding ways to do better. Led by Brenton Caffin, States of Change brings together a faculty with a huge amount of practical experience across the world. My own experience includes jobs in local, national and European government and doing hundreds of lectures and workshops at places like the UK’s Civil Service College, ANZSOG, the China Executive Leadership Academy and the European Union School of Administration. At the Strategy Unit I oversaw a big study of public leadership. I’ve been involved in programmes to train politicians too – from the Bloomberg Mayor’s initiative at Harvard to CMPS in the UK. 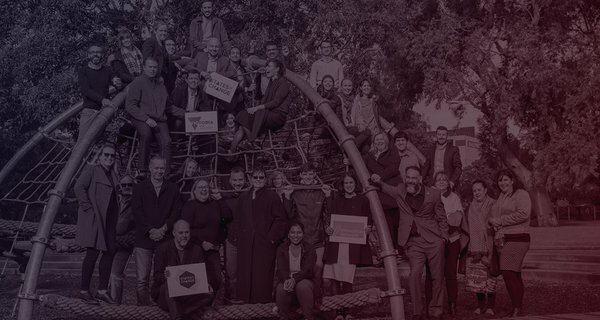 In the last few years I’ve had a visiting role at Harvard Kennedy School and I remain involved in an organisation I co-founded for younger leaders in the late 2000s - Uprising - that now has thousands of alumni across the UK’s big cities. This may all just mean that I and my colleagues have a more developed level of confusion. But I think that we have ourselves learned, and confirmed, important lessons about how learning happens (and I am particularly grateful to Jorrit de Jong, Mark Moore and other colleagues at Harvard for hosting sessions which helped me understand these lessons better). Here I summarise some of the key points. Officials need knowledge as well as skills. But what they need changes. They still need the classic management skills of good diagnosis, planning and implementation, as well as knowledge of political contexts or how the law works. But no one can get very far nowadays without some familiarity with digital, data, evidence, experiment, behavioural insights, new regulatory methods and public engagement (much of this curriculum was set out in my book ‘The Art of Public Strategy’ and Nesta’s recent Compendium of Innovation Methods provides a source book of some of the specific skills any civil servant interested in innovation needs to be aware of). So part of any programme for learning has to include some knowledge transfer – catching up with the best of the field. Yet many university courses lag some 10-20 years behind current best practice. We learn by increments. New knowledge has to fit into a structure of existing knowledge. Fantastic lectures, presentations and conferences are exciting. But the content doesn’t usually stick. That’s why scaffolding and steps are vital – connecting what you already know with what you need to know. This is the hard graft of curriculum design. Flying in a celebrity professor to do their set-piece talk is fun, but generally not very impactful. A related point is that we generally only learn things when they have been repeated, ideally many times. This is hard for high status people to admit. But it’s true of almost everyone. Again this is why curriculum design matters. In the language of John Hattie’s work on ‘visible learning’, learning tends to be work best when you 1) are clear what is to be learned 2) know that you’re learning it and then 3) reflect on what you’ve learned, ideally applying it quickly. I love books. But some of the most compelling lessons are learned by doing, not reading. Universities force learning to fit the frameworks they’re used to – courses of a certain length, lecture based pedagogy, and physically containing students within the campus. But learning is often much more effective if it’s organised around real, live problems. Applying new methods right away makes it much more likely they’ll stick. Learning by doing is at the core of many of the programmes I’ve been involved in – from Uprising with its social action campaigns to States of Change and GIPA (Nesta’s Global Innovation Policy Accelerator), with a circle of support around the learner to help them tackle a real life challenge. The specific project may become less important over time – but it’s a route into learning all sorts of things that then become useful in other ways. A related point is that public servants often want to learn from others who have real-world experience, rather than what they may see as second-hand, abstract or academic knowledge. They want to hear from people who have had to grapple with the messy complexities of politics, public opinion, media and often complain about overly academic professors. This is why States of Change was set up from the start with a global practitioner faculty who are streetwise as well as knowledgeable, and can draw on a repertoire of experience as well as readings. We learn below the neck as well as above it. Integrating new ideas, skills and knowledge into our sense of self and what we care about is crucial for real learning, which isn’t just an intellectual or cognitive process. That’s why it’s so important to link new knowledge to values and outcomes, showing how a new method will solve a deep and important problem for example. Any course that doesn’t return to those values, the ‘why?’ of public service, will be incomplete. That’s helped by discussing issues with real life citizens in the spaces they live in rather than just getting experts around a table. Mindset matters every bit as much as method. This is the biggest weakness of most university based courses that treat pedagogy as primarily cognitive. 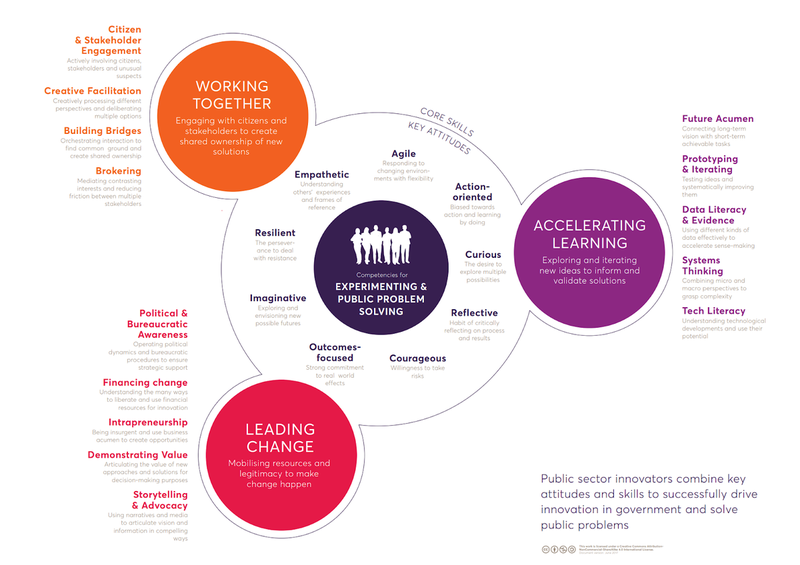 If you want creative, entrepreneurial, problem-solving public servants you have to cultivate different mindsets, attitudes and behaviours as well as new ways of thinking and acting. The States of Change approach operationalises this with a competency framework that links the formal and informal, cognitive and non-cognitive (see below). To be open to learning we often have to pass through discomfort and vulnerability and cultivate a ‘beginners mind’. In the UK we used to start sessions for the most senior civil servants with a quiz on critical facts about country. When most scored poorly (we were sensitive enough to keep their scores private) they became more willing to learn. Novel locations, experiences and tasks help people to shed their comfortable outer shells. So does being thrown into uncomfortable real-world situations where the learner is exposed, but comes through the ‘U’ curve of discomfort leading to insight. Simulations and role playing can also generate the kind of emotionally compelling experiences that help with learning. It’s great to skill up and inspire a cohort of change-making public officials. But if that’s all you do they may bump up against the resistance of the wider public service which is likely to have a powerful immune system that’s good at killing new ideas. 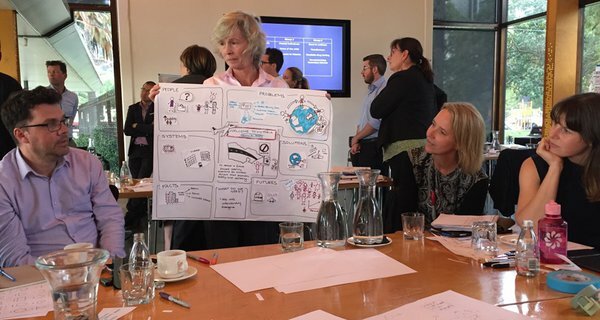 So we have increasingly emphasised methods that involve a wider group of civil servants in some of the learning – so that they share some of the diagnosis, the language and the insights. There are excellent examples of this in Victoria, the UAE and Canada. These help to ensure that new ideas aren’t just a superficial layer of initiative on top of essentially unchanging systems that continue to reward political agility and cynicism or at worst corruption and bullying, rather than public value. The most crucial moment of learning is when you reflect and digest. This is often missed out or undervalued. But this moment of digestion and reflection is vital – we’re all busy, distracted and worried about the inbox and tend to jump straight from the classroom back to the day job. But that’s a waste. Serious time devoted to digestion pays off many times over but is often left out from course design. So why is this hard? 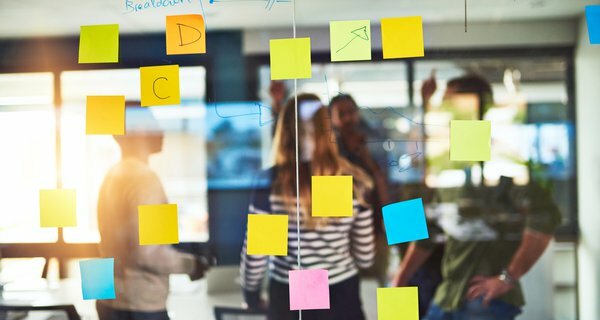 If you want governments to raise their game in solving problems, working with their citizens and making the most of new technologies then it’s vital to attend to capabilities in these ways. Unfortunately some civil service colleges are stuck in a time warp, and many of the courses offered by prestigious universities are high quality in their own ways, but miss out on these lessons. I’ve repeatedly been struck how high status institutions (from the OECD and EU to the UN) struggle to internalise these points. It’s also striking that the great majority of elite gatherings - at places like Ditchley, Davos, Aspen - use low impact methods. They favour relaxed chats, with panels and firesides, which are helpful for networking, and vaguely wander around big issues. But they’re very poor as learning environments and wholly unsuited to solving problems (and ignore all that is known about making meetings effective). They’re simulations of serious conversations rather than actually being serious conversations. That’s why many people steer clear. The six-month programme is open to any City, State or Federal government agency in the region.